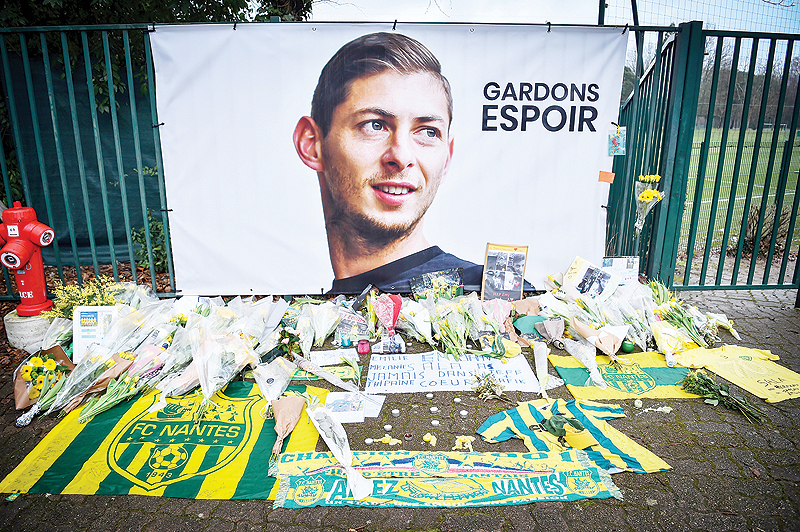 LONDON: British crash investigators told AFP yesterday they were planning “an underwater operation” in the next couple of days on the wreckage of a plane carrying Argentine footballer Emiliano Sala in the Channel. “There is still an ongoing operation gathering evidence,” said a spokesman for the Air Accident Investigations Branch. Asked whether an attempt would be made to recover the aircraft and the unidentified body that a remotely operated vehicle found on board, he said only: “An underwater operation will be conducted over the next couple of days”. The shipwreck hunter who found the remains of the plane on Sunday urged the authorities to urgently recover the body. “Time is of the essence when you’re talking about a body, so really it’s imperative that they proceed with the recovery of the plane and the body,” David Mearns said. Mearns was hired by Sala’s family to find the light aircraft after it disappeared near the British island of Guernsey on January 21, with the 28-year-old footballer and pilot David Ibbotson on board. He found the wreckage on Sunday, before the AAIB took over the operation. They revealed on Monday that a body had been found at the site. “Finding it is just the starting point. The AAIB has got to investigate it… The best outcome for the families would be to find the plane and recover both bodies,” Mearns said. “As tragic as the loss is, it’s made much, much worse if the body is never recovered or they never get an answer to what happened.” He is back at his home in England, but confirmed that AAIB divers are currently on the site, trying to establish what to do next. “You have to see whether you can lift the plane without disturbing the body and also making sure that you’re picking it all up,” he said. The discovery of two seat cushions on the French coast last week revealed that the plane was broken, Mearns added. “It’s in one area (on the seabed), it’s all one mass, but some bits may not be connected. So what you don’t want to do is to disturb the body in a way that you lose it,” he said. In the end, the AAIB chartered a ship to join Mearns on Sunday, and they identified the wreckage. He said recovery was now “technically possible — the water depth isn’t an issue really, and the weather can be managed with the right ship”. “It’s a matter of will to do it,” he added. Mearns was keen to praise the efforts by the Guernsey authorities in the days immediately after the plane disappeared.